Turn right on Moody Street. Moody's birthplace, 32 Moody Street, on the left just before the street veers left on to Winchester Rd. 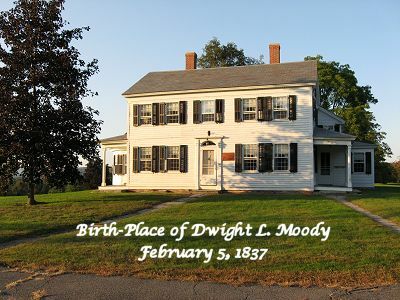 Mr. Moody's mother occupied this home until her death in her ninety-first year (1896). Up the hill behind the house is Round Top and the gravesite where Mr. Moody and his wife, Emma, are buried. Moody's Northfield residence is 22 Main Street (also Route 10 and 63). Photograph by Stephen & Dorothy Ross for WholesomeWords.org 2008.